“Don’t look back. Something might be gaining on you.” – There’s wisdom in these words by Hall of Fame pitcher Satchel Paige, but, as it draws to a close, 2015 still deserves a recap. We launched the year with a fun day at LACMA, where a pit bull loving cashier gave us free entry to the awesome Samurai exhibit. Later that month, we were fortunate to see our niece, the uber talented Margaret Spirito, perform her ‘Sound Of Dirty Jersey’ show at Rockwell, LA. Even better, we had a surprise visit from our Garden State friends TJ Coan and Jane DeNoble who joined us for the show. The month came to a fabulous close, when we met Pepperdine University Professor. Ginger Rosenkrans and her Marketing 475 students to kick off their spring semester ad campaign featuring Lou and GIMME SHELTER, as the client. Not long afterward, we learned that Lou’s alma mater, Iona College, had featured Gimme Shelter in their Magazine’s book section. Thanks to a strong recommendation from our producer friend, Doug Curtis, Lou landed a gig writing a script treatment for the true story of a lady pilot from the 1930s who defied her powerful banker father to elope with a young flight instructor. 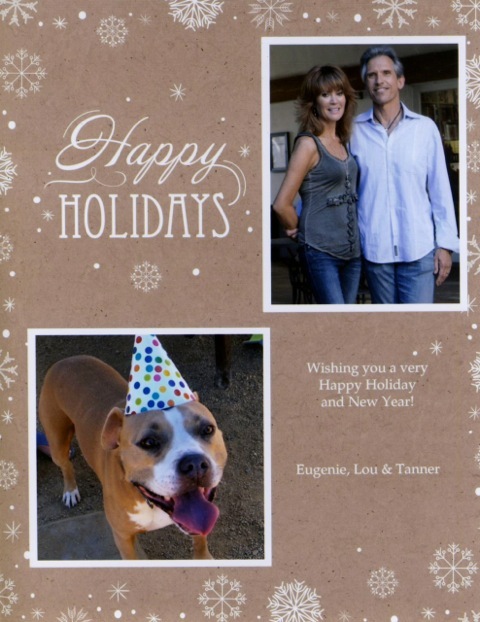 In February, the Malibu Times ran a nice piece on Lou, and fellow Malibu resident, radio hostess and friend Megan Blake, who were nominated for writing awards by the Dog Writers Association of America. Tanner and Megan’s dogs, Smiley and Angel, made the paper, too. Sadly, February wasn’t all good news. On Valentine’s Day, Lou’s birthday, Tanner injured his eye while playing with his pals Porter and Lola. The badly scratched cornea that would require five vet visits and take more than two months to heal. At the time we didn’t know how serious it was, or we might’ve skipped our getaway to San Luis Obispo. Glad we didn’t. March brought a very nice mention of Gimme Shelter on the Malibu Times Magazine book page. It was heartening to think that, after more than two years, our little book is still finding a warm, receptive audience. Like February, March was a bittersweet time. We were shocked to learn that our beloved friend, Tanner’s trainer Tony Rollins, had passed away from diabetes related complications and that one of Tanner’s favorite little buddies, Doug and Jean’s Ceba, had succumbed to old age. The feisty shih tzu was a regal, class act. Almost as shocking, but not nearly as sad, was the word that our bffs, Joe and Linda Simone, had quit NYC to for San Antonio, TX, to be closer to their son, Justin, and his bride, Nicole. April saw the culmination of the Pepperdine University marketing pitches. All three teams offered us amazing ideas for all sorts of social media applications, but Muse Media won the competition. For us, the highlights were their public service announcement featuring Tanner and voiced by our good friend Danny Ducovny, and a zany Bob Dylan inspired book trailer starring Tanner (of course) and Lou. The Pepperdine influence carried over into May, when we launched the redesigned Gimme Shelter and Lou’s new website. June was a very big month on the writing and sculpture front. First, GIMME SHELTER snagged a coveted (and very hard to land for an indie book) Publishers Weekly review to go along with a fun Instagram mention by indieBrag, the folks that honor the best in indie books. And he wasn’t finished. When a major producer raved about the movie treatment Lou had written, the client hired him to pen the film script tentatively titled Wings Of Love. Not to be outdone, Eugenie and her sculpture were featured in the Sustainability issue of Unity Art Magazine, her first (but certainly not her last) national publication. Martial arts got the spotlight in July, when Lou was hired to be a technical advisor for a video shoot on the Japanese art of kendo. He had a ball working with director Ben Kufrin and kendo Sensei Carry Mizobe. In August, we were rocked by the passing of our cherished friend and client Roberta Deutsch. A vivacious and talented dancer who appeared in dozens of TV shows and as one of the Jet girls in the movie version of Westside Story, Eugenie considered Roberta an older sister. In September, Lou got the news that one of his former karate teachers, Harlan Cary Poe, had passed away in New York City. The gloom lifted a bit in October and November when Lou and his cowriter, Max McGill, were awarded Fifth Place in the Writers Digest National Writing Competition for their screenplay Out-Rageous, the true tale of Perry Watkins, a feisty drag queen and the only soldier to successfully challenge the U.S. Military’s ban on gays. 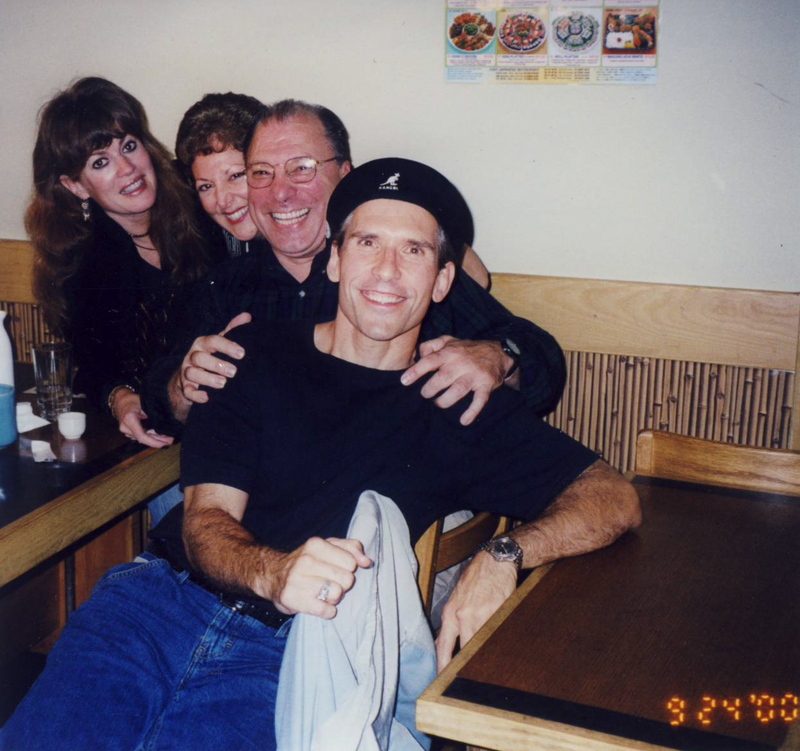 Later in the Fall, Lou had a sweet surprise when Sensei Mel Pralgo recognized his 35 years of martial arts training by promoting him to Godan or 5th degree black belt. 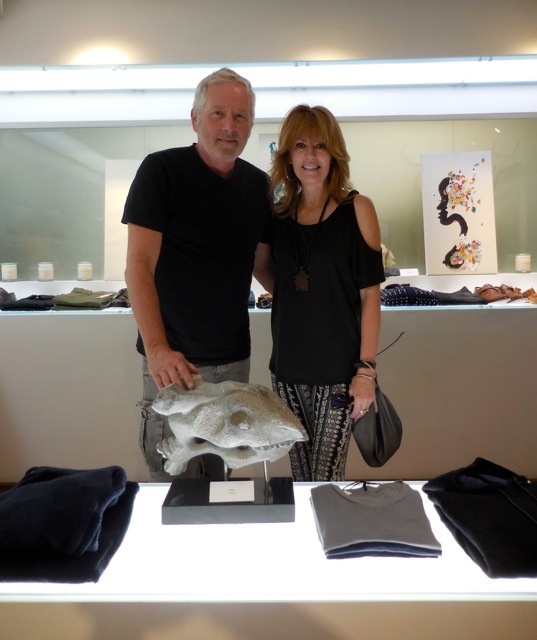 Not long afterward, Eugenie was part of a terrific group show at Canvas Malibu, where her sculptures are currently on display. December brought the year to a sweet, symmetrical finish. We opened the month as we started 2015 by attending Margaret Spirito’s revised and totally fantastic ‘Dirty Jersey’ show. The kid blew the roof off, garnering mad applause and rave reviews. Then, after much patient back and forth, the East River Academy at New York’s Riker’s Island prison purchased copies of Gimme Shelter to use in their dog training program. Coupled with the sales made to Los Angeles County’s Probation Department, the book would now be helping at risk youth on both coasts. We don’t want to spill the beans or jinx ourselves but 2016 promises to be every bit as terrific as 2015. If it all pans out, we hope to have big news about GIMME SHELTER. So, thanks for following us, and stay tuned.